Dr. Yoshiro Nishio, Research and Development Center for Submarine Resources, Japan Agency for Marine–Earth Science and Technology (JAMSTEC: Asahiko Taira, President) and his team with Assistant Professor Tomohiro Toki, University of the Ryukyus, identified the chemical component that experienced a high temperature of 310 degrees C (at maximum) in fluid recovered from submarine mud volcanoes (mounds formed by ejected mud derived from the deep realm) in the Kumano forearc basin located in the southeast of Kii Peninsula (figure 1). 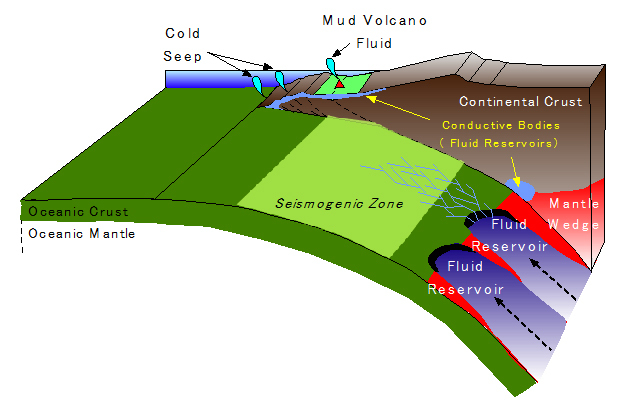 It has been proposed that fluids seeping from Kumano mud volcanoes derive from clay mineral dehydration, which typically occurs at temperatures between 60 and 150 degrees C (estimated depth of 5 km under the seafloor). In this study, the team precisely measured isotope ratio of lithium (7Li/6Li ratio) in the fluids since it provides an indication of a record of water temperature (figure 2). As a result, it became clear that, in addition to fluids from clay mineral dehydration, it also includes fluids with a record of temperatures between 210 and 310 degrees C (estimated depth of 15 km under the seafloor), which is equivalent to temperature in the Nankai seismogenic zone. This finding suggests fluid regimes in the Nankai accretionary wedge are more complex than previously believed. It is also a significant scientific achievement in understanding crustal deformation and material circulation in the plate boundary (figure 3). These study results have been posted on the Elsevier’s online journal of Earth and Planetary Science Letters on January 28th. 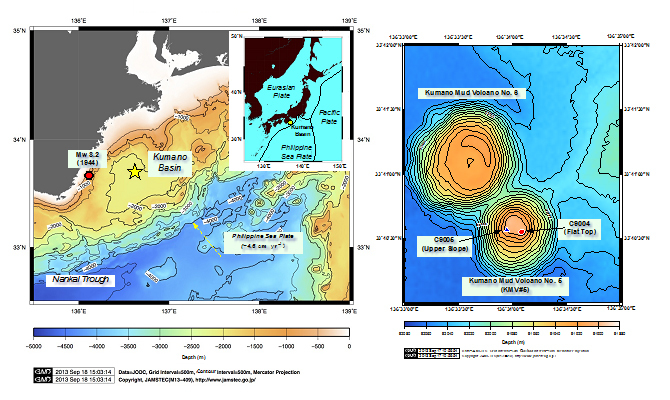 Figure 1: (Left) Bathymetric map of the area surrounding the Kumano forearc basin showing the locations of Kumano mud volcano No.5 (KMV#5). (Right) Enlarged bathymetric map of the area around KMV#5. 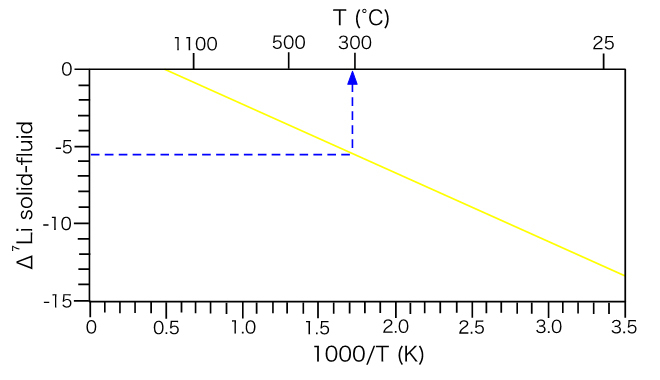 Figure 2: Conceptual diagram showing how to estimate temperature based on difference of Li isotope ratio between fluids and rocks. Figure 3: Diagram shows routes in which upward transport of fluids with temperature of 300 degrees C (or higher) derives from the depth reaches submarine mud volcano populations in the Kumano forearc basin, Nankai Trough. It is possible that the upwelling of mantle-derived fluid through the plate interface might be related to formation of mud volcano and also crustal deformation in the sea.